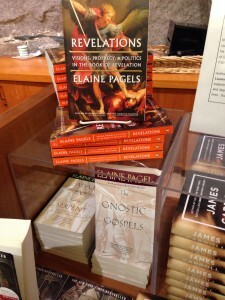 Revelations: Visions, Prophecy, and Politics in the Book of Revelation, Viking Penguin, New York, 2012. Reading Judas: The Gospel of Judas and the Shaping of Christianity, co authored with Karen King, Viking Penguin, New York, 2007. British edition, England, Penguin Books, 2007; German edition, Beck Publishers, 2007. Beyond Belief: The Secret Gospel of Thomas, Random House, New York, May, 2003. Spanish edition, Critica, 2004; Brazilian edition, Objectiva, 2004; German edition, Beck, 2004; British edition, MacMillan, 2004; Dutch edition, Kosmos, 2004; Portuguese edition (Brazil), 2005; Italian edition, 2006; Greek edition, Enalios, 2006; Japanese edition, Seido Sha, 2006; Korean edition, Rubybox, 2006; Serbo-Croatian edition, 2006; Spanish edition, 2006; Polish edition 2008. Created Equal, Essay published as a booklet in a series on The American Dream commissioned by the Fetzer Institute, 2004. The Origin of Satan, Random House, New York, April, 1995. Also published in foreign editions. Adam, Eve, and the Serpent, Random House, New York, 1988. The Gnostic Gospels, Random House, November, 1979. Received the National Book Critics Circle A ward (1979) and The American Book Award (1980). Also published in foreign editions. Paul the Gnostic: Gnostic Exegesis of the Pauline Letters, Fortress Press, Philadelphia, 1976. The Johannine Gospel in Gnostic Exegesis, Monograph Series of the Society for Biblical Literature, Abingdon Press, Nashville, 1973. “How Athanasius, Subject to Christian Emperors, Read John’s Apocalypse into His Canon,” in Envisioning Judaism: Studies in Honor of Peter Schäfer on the Occasion of His Seventieth Birthday, ed. Ra’anan Boustan et al. Tübingen: Mohr Siebeck, 2013, 2, pp. 799-808. “Strategies of Esoteric Exegesis,” in Hidden Truths from Eden: Esoteric Readings of Genesis 1-3, ed. C. vander Stichele et al. 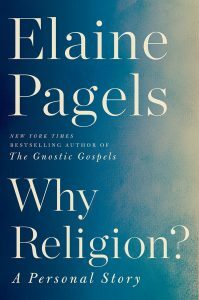 Atlanta; Society of Biblical Literature Press, 2014, 237-247. E.J. Brill, 1985, pp. 159-338. Nag Hammadi Codex I, 5: The Tripartite Tractate by Harold W. Attridge and Elaine Pagels. Notes. In: The Coptic Gnostic Library, Volume 23. Leiden: E.J. Brill, 1985. Nag Hammadi Codex III, 5: The Dialogue of the Savior. Contributors: Steven Emmel, Helmut Koester, Elaine Pagels. In: The Coptic Gnostic Library, Volume 26. Text edited with translation, introduction, and notes. Leiden: EJ. Brill, 1984. Introduction and textual notes for the first edition of The Tripartite Tractate, Nag Hammadi Codices I, 4, to be prepared in collaboration with Professor H. Attridge. Publication arrangements are similar to those for the other texts, Leiden: E. J. Brill. Brief versions of the above introductions to: The Dialogue of the Savior; The Tripartite Tractate; The Interpretation of Knowledge; A Valentini an Exposition, in: The Nag Hammadi Library, Harper and Row, New York, 1978.